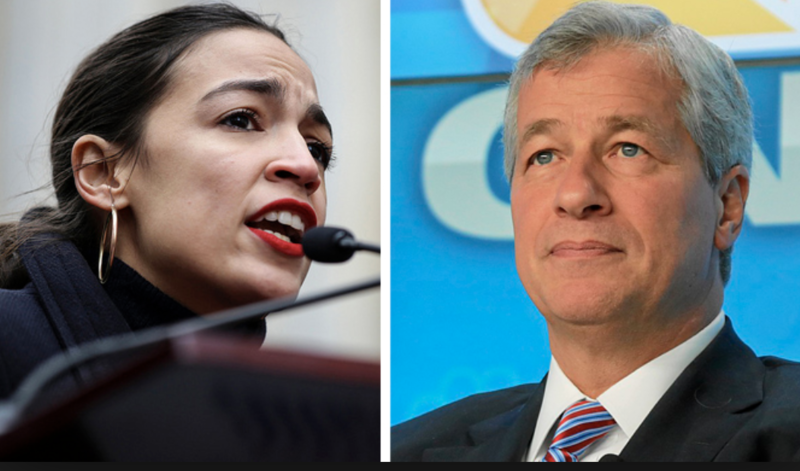 Will Dimon Triumph Over AOC, "Kerosene Maxine" During Wednesday’s Washington 'Circus'? For the first time since 2009, the CEOs of America's largest banks will gather in Washington to testify before the House Financial Services Committee, which in the new era of Democratic control has fallen under the sway of some of the chamber's most progressive, anti-business members - case in point: Chairwoman Maxine Waters, who hopes to make the excoriation of Wall Street fatcats a hallmark of her tenure. To say that Wednesday's hearing is expected to be highly dramatic would be an understatement. As both moderate Democrats and Republicans have privately groused, a free-for-all with 60 lawmakers and seven executives isn't exactly an environment conducive to substantive policy discussions. And that's likely by design. Rather, Waters and some of the committee's other high-profile members - including Alexandria Ocasio-Cortez, who is expected to attend the hearing and has reportedly refused to meet with the CEOs' lobbying group - will almost certainly try to treat the CEOs like pinatas in a public showing of just how tough they are on special interests. And following Tim Sloan's scalping at the hands of Elizabeth Warren earlier this year, the CEOs have reason to be anxious - and not just because they will be forced to mingle with the plebs on the Acela on their way to the Hill (their PR teams have reportedly forbade them from flying in their jets). Though the Wall Street Journal reports that the executives are planning to make the case that the American financial system is less risky (that's debatable) and more tightly supervised than it was before the crisis, Bloomberg reveals that many of the CEOs are nervous that they might do or say something that Ocasio-Cortez & Co. could use against them. But despite being outnumbered and outgunned, the CEOs will walk into tomorrow's hearing with at least one ace up their sleeve, according to BBG. His name is Jamie Dimon. As the only Big Bank CEO who has kept his job since the crisis, Dimon is also the only member of the group who was in the room when the leaders of Wall Street were last hauled before Congress in 2009. He also recently published a manifesto - his annual missive to JPM shareholders - laying out "common sense" reforms to address economic inequality, a missive that reads almost like the platform for a third-party run at the presidency. Expect Dimon and AOC to go head to head about socialism's ability to destroy prosperity, and her successful campaign to drive Amazon out of NYC, which Dimon has publicly criticized. "There is no doubt that the strength, stability and resiliency of the financial system has been fundamentally improved over the course of the last 10 years,” Dimon reportedly said in prepared remarks. "Postcrisis reforms have made banks much safer and sounder in three important areas: capital, liquidity and resolution and recovery." Dimon's ability to mesmerize lawmakers is legendary. His denunciation of the "London Whale" scandal as a "tempest in a teapot" saved his bank's reputation, and quite possibly his job, while seemingly erasing the public's memory of the massive multi-billion-dollar loss. And though Dimon's compensation has risen to its highest point since the crisis, he has gone on record to say he would have no problem paying more in taxes...so long as the money was being put to good use. On this, he'll have some help from BofA CEO Brian Moynihan, who on Tuesday announced plans for the bank to raise its minimum wage to $20 an hour over the next two years, beginning in May with a hike to $17, as CNBC reported. Expect Dimon to expound on the idiocy of Democratic proposals to ban corporate share buybacks, insist that, even though he opposed it at the time, Dodd-Frank ended up being good for the financial system (but that doesn't mean some of its more restrictive constraints on lending and trading shouldn't be eased) and even explain away the widening gulf between CEO wages and the average worker by deferring to his widely publicized thought leadership on the subject. Also expect Dimon and his peers to highlight their efforts to improve diversity and improve lending in low-income communities (subjects Dimon also touched upon in his letter). But even Dimon's aptitude for tangling with lawmakers can only get the group so far. And there are some issues that the JPM CEO likely won't be able to confront - but fortunately for him, they mostly pertain to scandals at other banks. One example: Goldman's facilitation of the massive 1MDB scandal. Lawmakers will almost certainly have questions about this for CEO David Solomon, who is relatively new in his position and has been struggling to clean up the mess left by his predecessor, something that Lloyd Blankfein, if he's watching, will undoubtedly find endlessly amusing.